Home GENERAL NEWS Govt. targets to create 1 million jobs by 2016. Govt. targets to create 1 million jobs by 2016. Government is implementing the industrialization and job creation strategy targeted at creating one million jobs by 2016 through foreign and local investment in four growth sectors of the economy. And government has said it has finalized consultations on areas of the labour laws that require amendments. Local Government Deputy Minister Forrie Tembo said government recognizes job creation as strategy in ensuring the stability of society and the overall growth of the economy. Speaking in Luanshya yesterday during the labour day celebrations under the theme “Zambia at 50: Creating decent Work and Promoting Social Economic Justice For National Development”, Mr. Tembo said the theme was appropriate as it recognizes where we have come from as a country and also indicates the areas that need to be addressed in order to foster national development. He noted that while Zambia had won political independence, the country still faces huge challenges in ensuring all citizens are economically free. Mr. Tembo further stated that government has finalized consultations on the areas of the labour laws that needed amendments, saying government attaches great importance to the process of reforming the labour laws to protect and meet aspirations of all workers. 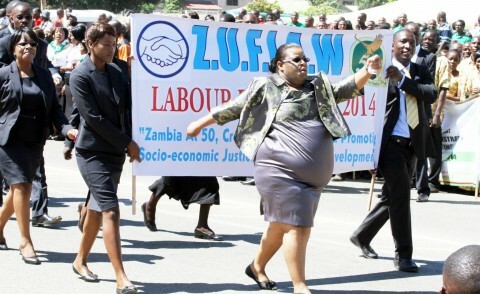 He said in the same vain, government in December launched the second Zambia decent work country programme to run up to 2016. And Luanshya Mayor Gordon Siwale appealed to labour unions coming from sectors which have multiple representations to learn to speak with one voice when dealing with common causes such as salary increments. Mr. Siwale said doing so would help members derive maximum benefit from what they bargain for with their employers. And Federation Of free Trade Unions National Secretary Baison Mando commended government on the achievements scored in various sectors of the economy which include infrastructure development, job creation, and national stability. Mr. Mando however said the country still has a lot of challenges owing to unemployment as young people were still not able to find quality jobs, thereby threatening national stability.